Puppets brought to life and a strange king. Just another day in the Kingdom of Magnolia for the puppet maker Gajeel Redfox, till he gets an invitation to the castle from the king and Puppet Master himself. I placed the small bouquet of flowers on the grave before heading back to town. The city was quiet since it was still early, the sun barely peeking above the horizon. I walked up to my shop &apos;Redfox Puppets&apos; and unlocked the door. I took over the place when dad died, even though I was still just a kid. I looked around suspiciously, everything seemed intact. My apprentice must be late... Again. I sighed. At least I get some quiet for the day. I took my jacket off before throwing in my work apron. Clay puppets today. I opened the shop like I do every day. I set out small doll displays, open the blinds, set out tools and get the clay prepped. All before flipping the &apos;Closed&apos; sign to &apos;Open&apos;. I sat at the old work table and got to work. I molded quietly for nearly an hour before the door was thrown open. "Your late Grey." I said without even looking up. "I know. My bad." the dark haired man said as he breathed heavily. He quickly put his things in the back before coming out in his work apron. I didn&apos;t understand why a guy like him wanted to learn this art. Then again most people didn&apos;t understand why a thug looking guy like me did this work. The door opened again and a small pink haired boy came running in. "Neal I swear if you break anything this time," a blonde haired woman called after him as she entered. I smiled at her. "Good morning Lucy." 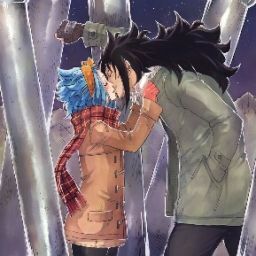 She smiled at me,"Morning Gajeel. Grey." I got up and pulled a chair out for her. She was pregnant and so far along it looked like stand was just too much effort. "Since when are you a gentleman?" she smirked but sat anyway. "Tch. Fine see if I be nice again." I grumbled. She laughed at me as she caught Neal when he tried to run through the store. She set him on her lap. I went back to my work table,"What brings you in this morning Mrs.Dragneel." Grey asked. She rolled her eyes. "Just Lucy will work. "Well what else would I be doing here?" I huffed. "What does that man want now?" "That man is our KING and he requested that you join him at the palace tonight. He is so pleased with your work he would like to hold a small dinner for you. "She handed out and envelope to me. Grey clapped my shoulder. "Good for you Gajeel!" "Tch, he just wants me to fix his servants... You&apos;ll come with me this time Grey." His eyes widened. "O get to got to the palace?" I nodded. Poor boy looked like he was gonna faint. "Man up damn it." I looked at Lucy who was giggling. "Is Natsu still there?" she nodded. "And actually he just got promoted to captain of the guard." I nodded as I turned back to work on the doll on the table. Neal managed to wiggle his way out of Lucy&apos;s arms and ran to me. "Uncle Gajeel!" I looked down at him and picked him up. "What do you want squirt?" "You havnt forgotten have you?" he looked at me with big brown eyes. He got those from his mom. "Hmm what do you mean?" the boy pouted. "My birthday of course!" I shook my head. "I&apos;m pretty sure you had one last year. Gihee." I chuckled as he hit me with his tiny fists. I pulled out a blue wrapped box from the cabinet beside me. His eyes got big but I held it away as he went to grab it. "You still got a few days rugrat. If you be good for your mom till then then you can have it." he pouted but nodded. He hopped down as Lucy stood up. "I best be going. Errands and all." I nodded." Don&apos;t strain yourself." she smiled and left, taking Neal with her. Grey and I worked through the day, coming out to a total of six new puppets. I sighed as I washed up in the back. &apos;I don&apos;t want to go to the palace&apos;. I walked out front an waited for Grey while he finished closing the shop. Once he was ready we set off towards the large white castle. "So have you ever been to the castle Gajeel?" "Only once about three years ago. It was right after Neal was born and Lucy was bed ridden so I had to make a delivery. Didn&apos;t make it past the gates though." He nodded and we continued in silence. We approached the large iron gates where to soldiers stood. They were puppets made of steel. "Your master has requested us." I handed them the letter Lucy gave me. They stepped aside without a word and the gates swung open. We quietly walked towards the palace doors and entered. A woman with long blue hair and fair skin walked toward us. She was about as tall as Grey and wore a maid uniform. As I looked closer I could see her skin was wooden. Another puppet. She bowed deeply. "You must be Mr.Redfox and Mr.Fullbuster. Please follow Juvia." she turned and started down a hall. We followed her, Grey seemed very intent on not letting her out of his sight. She lead us down a long hallway and opened the door to a small dining room. King Siegrain was already seated at the table. "Welcome gentlemen! Please have a seat." we bowed before doing so. Another maid entered carrying a tray of drinks. This one was also blue haired but it only reached her shoulders. She was very short, a little under five feet. Her skin was pale as snow and flawless. Big brown eyes that were cast downwards, were framed by thick eyelashes. She looked very familiar. The king must have seen me staring. "Beautiful isn&apos;t she?" he said. I shrugged. "Very pretty." Siegrain smiled. "She is a very sweet doll. Rare too." so she was a puppet too. Must be porcelain. As I looked closer I could see the nearly invisible joints in her arms. "Fine craftsmanship." I murmured as she set my drink in front of me. Why does she look so familiar. "I would hope you would say that. I mean I know it&apos;s been ten years, but I would hope you wouldn&apos;t forget a girl you named yourself." I nearly choked on my drink as I looked up at the girl. It finally clicked in my head as she looked up at me and smiled. "It&apos;s good to see you Gajeel." she said sweetly.